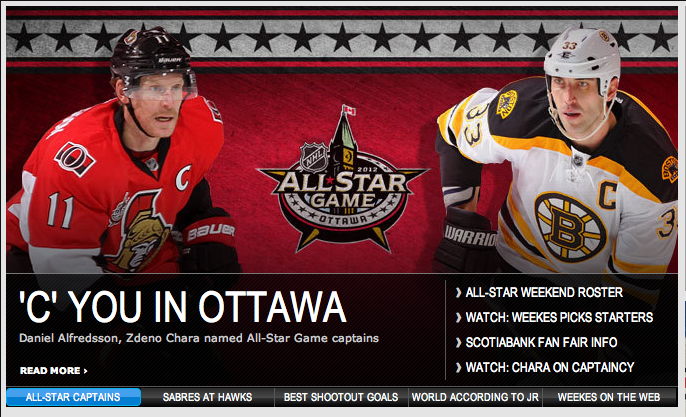 Say hello to your All Star Game captains. welp. there ya have it. So.. tell me, what are your thoughts? Give us a night off + any form of alcohol + Tumblr + Youtube–and you get a little something like this…..
Beware. Longest post ever, but I promise it’s worth it. I’m trying so hard to find one word to sum up what has happened this weekend, but I can’t. I was apart of Bruins & Boston history yesterday and it was an unreal feeling. As much as I said ‘Thank you’ to the players as they walked by, most of them said ‘No, thank you!’ You could really see just how much this fan base meant to the players as they grasped their heads and shook it in disbelief. More than a million people flooded the streets of Boston yesterday just in the hopes of catching a glimpse of Lord Stanley’s Cup and the boys they love so much. But, let’s back track to friday night where the adventure began. According to Garden security, Baby Seguin had just left for his apartment (which I now know where it is…mwhahahaha *evil laugh*), Brad Marchand was on the 80’s Party Bus all night, and Shawn Thornton had the Cup with his wife since it was their anniversary. Out of respect of Shawn & his wife, we decided we wouldn’t try and find the Cup at the restaurant they were at…we’d just try and scour the streets of Boston for the Party Bus. For such a popular bus you would think it would be easy to find, right?! Wrong. We walked around from 9pm – 1am and found nothing. But that may have been our fault…we couldn’t resist the 100 hundreds of bars along the way. Between country night at Hurricane O’Reily’s and Piza & Beer at Ernesto’s in the North End…we had our hands full. So we ended our night at 1am when we realized Brad was still out there and we had no shot of finding him. 4am came all too quickly…especially when 5 people cuddled in a 1 bedroom hotel room. 5 people + one bed + 3 pillows +tons of laughter = zero sleep. So we staked out our spot on Tremont Street and didn’t move (with the exception of one bathroom trip) until the parade started. I will admit, we overestimated the enthusiasm of the Boston fans…getting up at 6am would have worked just the same. But it’s all about the adventure, right?! 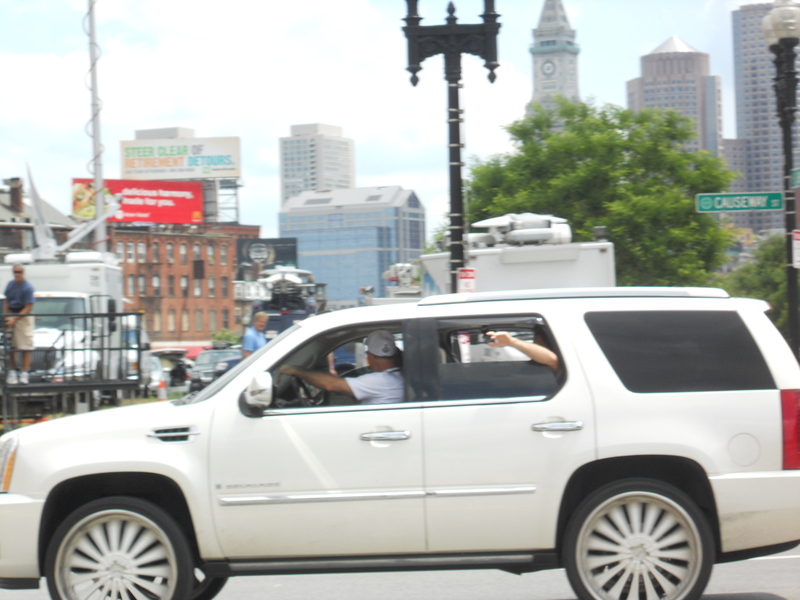 While sitting on the curb shoving munchkins into my mouth, Brad Marchand drove by….leaving me speechless. I kinda just pointed (still half asleep)…and continued shoving food into my face. Hopefully, he didn’t see me (even though we were the only insane fans on the street at 5am). I’m guessing he had a great time friday night if he was just leaving the Garden then. Mr. Jack Edwards --and even though he said he was late, people still mobbed him. Poor guy. As the hours crawled by, the streets began to fill with black & gold. Buses & buses of Boston Policemen were shuttled into the city as well as from other towns outside Boston. Only town police I didn’t see was mine…figures. 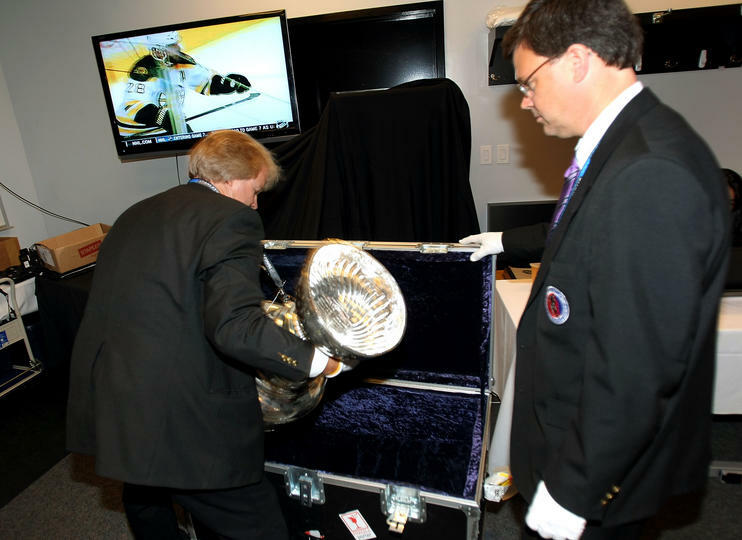 Lets fast forward to my first sighting of the cup, shall we?! The crowd went wild as confetti was blown into the air and Big Z hoisted the Cup in the air. 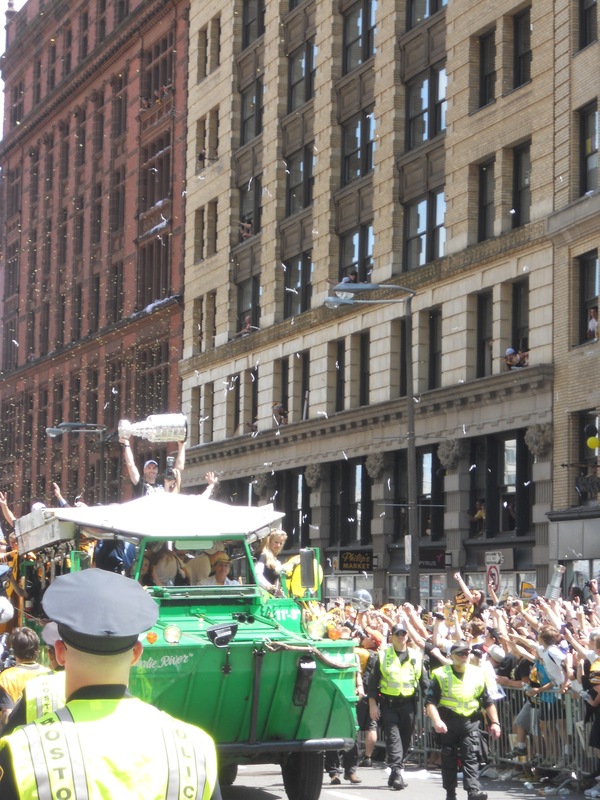 What you don’t get to see in this picture is Z ignoring the Boston Police & Cup Caretaker’s orders of ‘staying on the duck boat’. Chara decided to be a rebel and take the Cup off the boat and into the crowd so a few lucky fans could get up close and personal. From there he walked down the route and handed it off to the next duck boat in line. Sadly, I was too busy trying to take a picture so when I reached out to touch it, I was inches shy. Security was not happy, but the crowd sure was. I was almost pushed over the barrier a few times, but it was so worth it. The parade was nuts. The only players I wanted to see who I didn’t was Baby Seguin and Timmy T (but read on…it gets better). We decided after the last duck boat passed us that food was next (plus a run through some water fountains–it was blazing hot out). 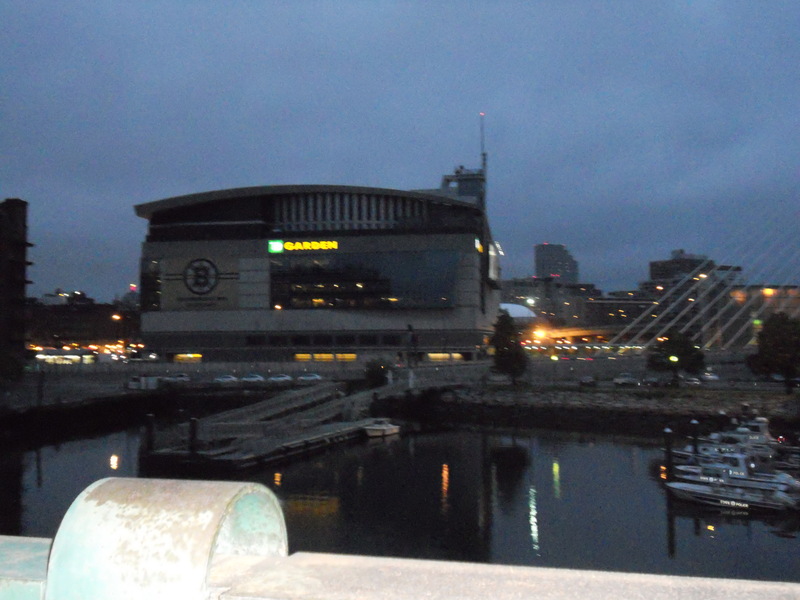 Once we heard the crowd roar by the Garden, we knew the boys were finishing up the route and it was time to make our way back to the Garden for some player sightings. While everyone was waiting at the Garden entrance for the boys, what they didn’t know was that the players parked on an alley beside the Garden. So we made sure the grab a spot on the grass and keep our cameras handy. Lucic and his girlfriend walked away from the Garden hand in hand. As jealous as I want to be of her, I can’t be. They are absolutely adorable together and she is the sweetest girl ever. Great pick Lucic…she’s a winner. Keep her around. 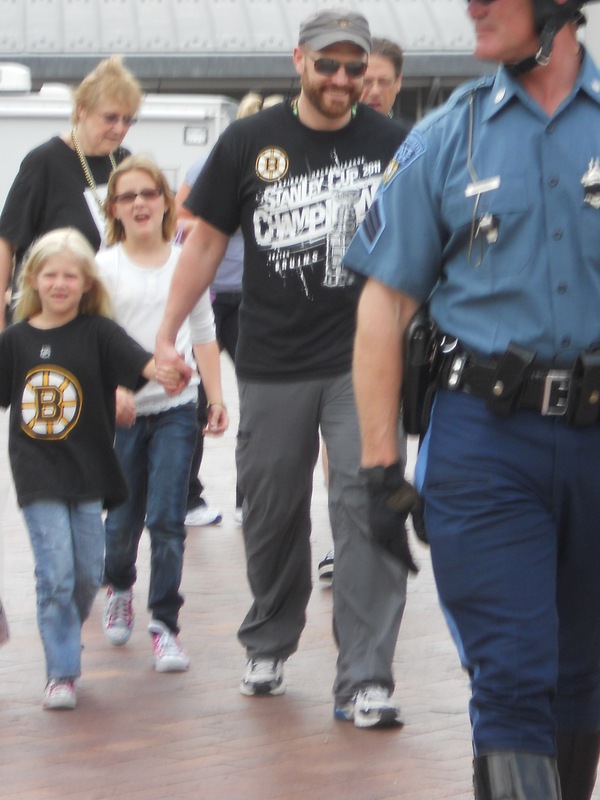 While I was grabbing a picture of Lucic, I hardly noticed Horton walked right past me with his baby in arms and wife in tow and Shawn Thornton on the other side. I quickly said ‘Hey, you’re you.’ (like an idiot and speechless fan girl). He simply smiled and nodded. Out of respect for his wife, baby (who looked so scared–poor thing) I decided to put the camera away until they walked past me. His kid was super cute, but noticably overwhelmed by all the attention his daddy was getting so having a camera in the face wouldn’t have been a good idea. 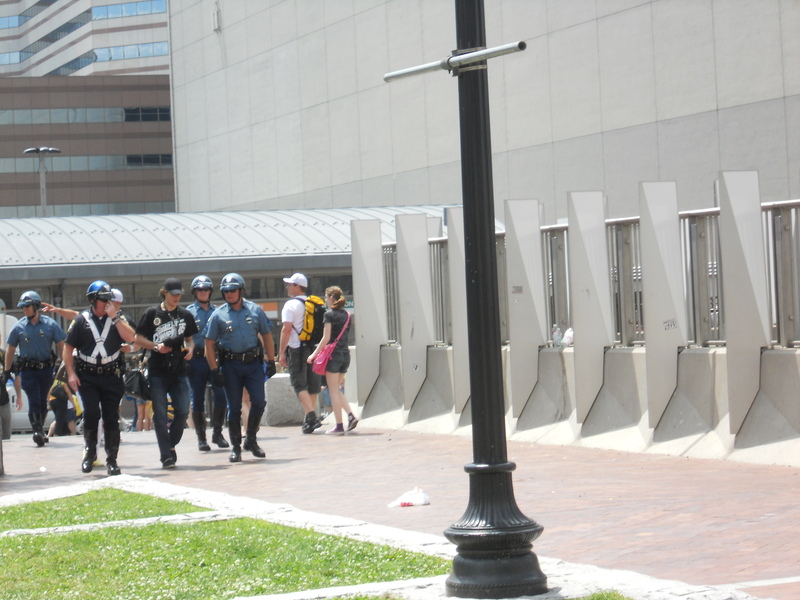 Once everyone caught onto what was happening, the chances of players escaping without a mob was zero and the Boston Police had to step in. Daniel Paille was one guy who didn't seemed to be minding the attention. What a sweetie. Stopped and signed for young fans. 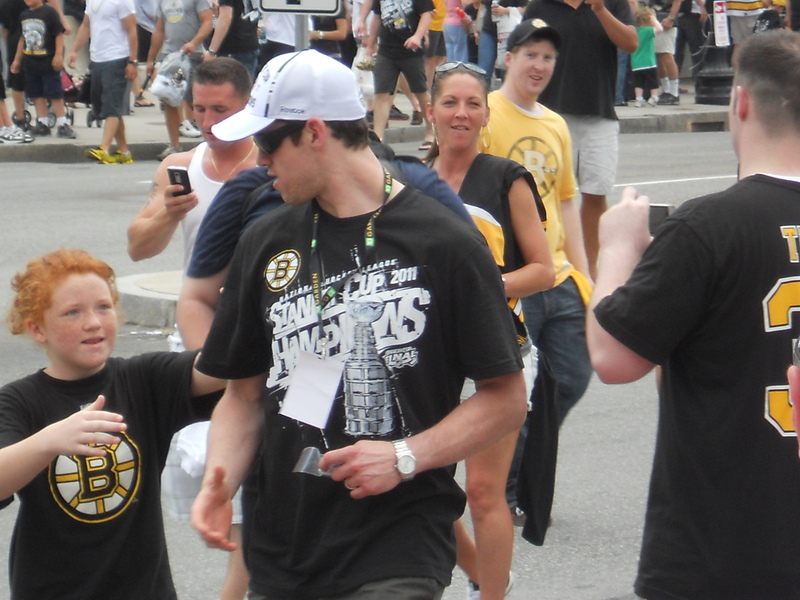 Across the street, Andrew Ference was escorted away but also didn’t mind the attention he got from the fans. Then out of nowhere, a roar errupted from the Garden and everyone rushed the streets. 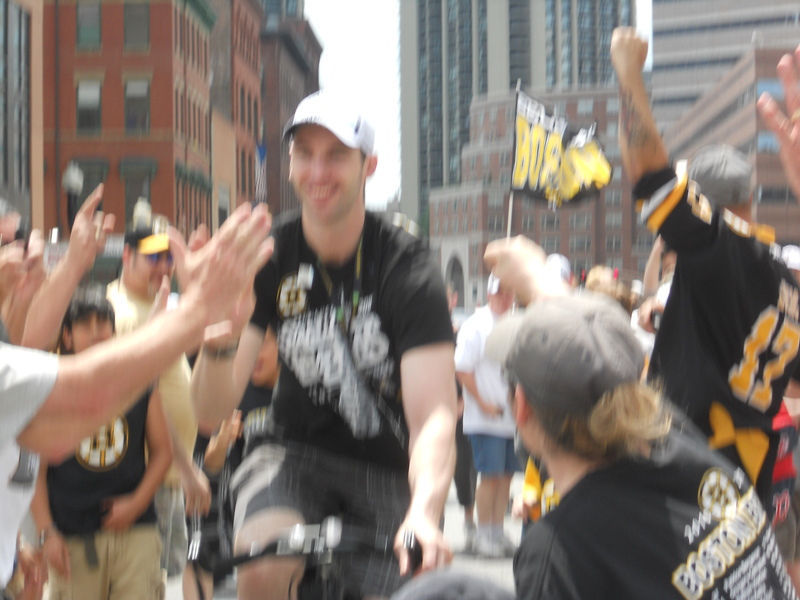 Big Z riding his bike home. Sorry for the blur, I was mobbed. Right behind him was Patrice Bergeron, another guy who got mobbed. Bergy and a hundred of his closest fans. He also has the sweetest girlfriend ever as well. Someone pushed me right into her almost knocking her over. I quickly apologized making her laugh and say “It’s ok sweetie, you’re fine.” –what a trooper for putting up with her boyfriend’s famous-ness. By the way: Chuck (from WUYS)…I now know where he lives. Let me know when you want to begin Operation: Kidnap Bergeron …I’ll help you out. No, out of respect for him, I wont be posting the picture of his apartment. Poor guy couldn’t leave for hours because of the amount of people surrounding it. I looked on from a distance and laughed. 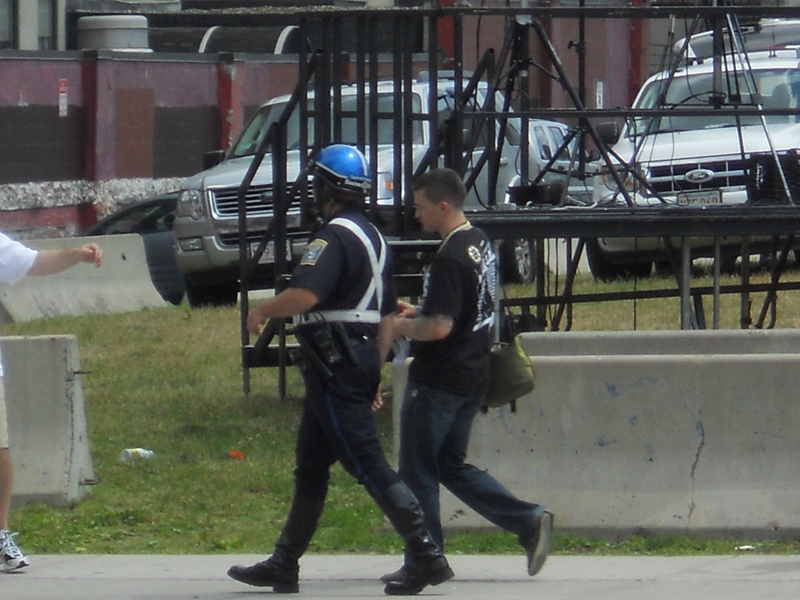 The next brave soul who was escorted out with 4 Boston Policemen was good ole Tuuka (note: not wearing Horton’s helmet anymore). And last, but certainly not least, the man of the hour. Timmy T. Sweetest man on the face of the earth. Still smiled even if he was mobbed by half of Boston. The rest of the players had already left for Foxwoods, so that’s all the player sightings I have for you. I’m sure over the summer, there will be more as the mysterious–hard to find–Cup makes its way around the world (and Boston). While PKane dances, Marchand sings. As much as I hate when Boston uses the Black & Yellow song (umm hello–that’s all Pittsburgh–leave it alone already), that was kind of funny. All in all, even though I only got 2 hours of sleep over the course of 2 days, I had an amazing weekend. I don’t think anything can top this. 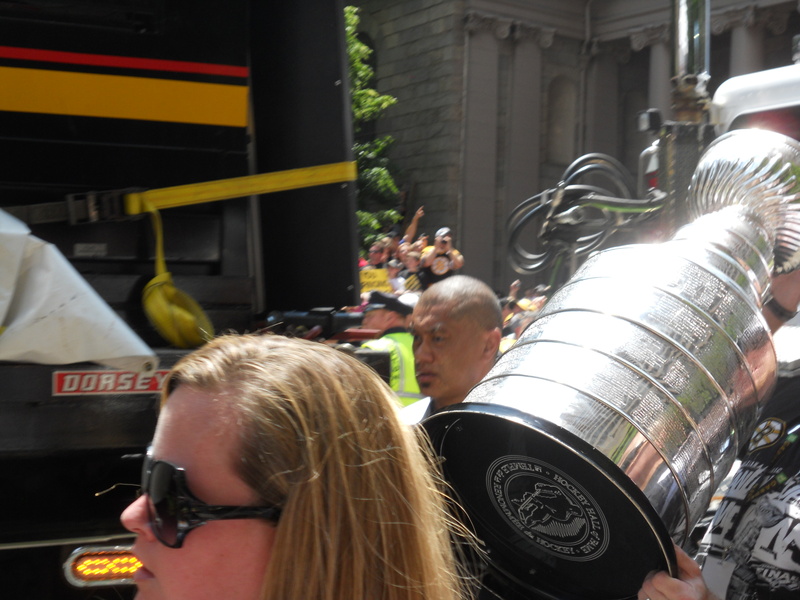 The images of Big Z rounding the corner onto Tremont St with the Cup in the air and Shawn Thornton running past me with the Cup will be burned into my memory for the rest of my life. I can only hope I can experience this again sometime down the road. What a great season Bruins. You deserve this. Thank you. I will be making a Hockey’s Finest flickr account and from there I’ll post all the pictures for you guys. …is to commence tonight as soon as I get out of work. Drive home, pick up friends, grab the T, and begin. Booked my hotel room. Packed my bag. And set my route–well, sort of.If anyone has any suggestions as to where you think we should try to hit up…let me know via comments/twitter. As of 6pm tonight, I will be scouring the streets of Boston with friends to catch a glimpse of the world’s coolest/shiniest “cup”. We’re pretty stoked. Dad graciously let us use his hotel points–seeing as we’re broke college/ex-college kids. We’ll pack a bag full of energy bars & water and then be on our way. Sleep is somewhat on the agenda tonight. But as soon as 4am strikes the clock, we’re back on the road to find our parade spot. Dedicated?–yep. I won’t be posting any Stanley Cup action until Sunday morning…so if you need updates, follow our Twitter. PS- Big Z, Bergy, and Timmmay have 13 hours to get the Cup back to Boston from NYC. The Today Show totally threw a wrench in my plans for tonight and I am not happy. This thing needs a GPS Tracker on it.